SK-II Skin Signature Cream Skin Signature Moisturising Cream strengthens Skin Power* by helping to restore firming moisture, smoothness and radiance. It contains Vitamin B3, Pitera® and Oli-Vityl, including skin conditioning ingredients which deliver a similar benefit to those naturally in your skin. *radiance, smoothness and firm appearance improvements. Skin Signature Moisturising Cream strengthens Skin Power* by helping to restore firming moisture, smoothness and radiance. It contains Vitamin B3, Pitera® and Oli-Vityl, including skin conditioning ingredients which deliver a similar benefit to those naturally in your skin. yeast strain from which Pitera™ is naturally derived. 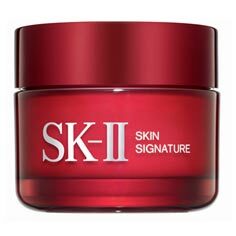 SK-II Pitera™ contains components of Natural Moisturising Factors (NMF) that occur naturally in the skin. Pitera™ also has other ingredients such as polysaccharides that improve the skin functions. The combination of Pitera™’s delicate balance of vitamins, amino acids, minerals and organic acids, and the Natural Moisturising Factors it contains, gives it its unique ability to adapt to the skin, yielding multiple skin benefits to bring skin back to harmony. Pitera™ is full of Vitamins, Amino Acids, Minerals and Organic Acids that work togetherto allow the skin’s natural surface rejuvenation process to function at its prime.